At the point of drafting this post I’m about 200 pages in and there’s this sense of foreboding and the novel is already hinting that something terrible is about to happen. I love Louise Candlish’s writing in this novel, so atmospheric…just like the cover! This was our book club read for April which was my choice. I picked it based on Claire’s (Art & Soul) recommendation and I wasn’t disappointed. Almost had me in tears at the end! I’ve never read Jane Eyre and believe this novel is a retelling. I’m not usually a fan of messing around with originals but I was intrigued by this one so requested through Bookbridgr. I’m really glad you liked the lighthouse book. I think it’ll make a great film (although we’ll all need a packet of tissues because it’s sure to be a weepie). I hope everything goes ok at the hospital and you enjoy book club. At least the book will give you plenty to talk about. And by “positive” I mean “good”… not “shows up you have a problem”! Terrified to read See How They Run, but don’t see how I can’t! The Swimming Pool’s cover has to be the most attention grabbing one I’ve seen in the last year, I think I’d get the paperback just for that reason! It’s soooo good, I don’t think you’ll be disappointed! I find Jane Steele very intriguing. Jane Eyre is one of the few classics I managed to finish and like (I am still proud of myself for this achievement). I won’t check The Light Between Oceans because I am short on tissues! Lame excuse, but I am not in the mood for tears right now. I think I’d even prefer a horror story, and I am a wuss, so that says something! It is getting harder to resist and buy See How They Run. *looks at her TBR* Nah, I must behave! For now. Doing this meme each is not good for the TBR so I know exactly where you’re coming from. You have to be so selective in what you choose to add! I haven’t read any of these but I’m very interested in reading Jane Steele. I haven’t read Jane Eyre, but this just sounds so so so good. I sobbed after finishing The Light Between Oceans, such a great book. I also really enjoyed Jane Steele. I’m currently reading The Dark Inside by Rod Reynolds. I cried too…as a book club we’re going to see the movie later in the year too…I expect it’ll be even more heart-breaking than the book. I’m glad you liked The Light Between Oveans. That was a book club favorite in my group as well. 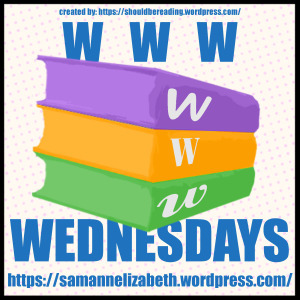 Happy reading and thanks for participating in WWW Wednesday! I’m seeing so many thrillers as I do the rounds of WWW this week! The Swimming Pool and See How They Run both sound very intense. I really need to get around to having the thriller month I keep promising myself. Lovely post 🙂 The Swimming Pool has intrigued me!